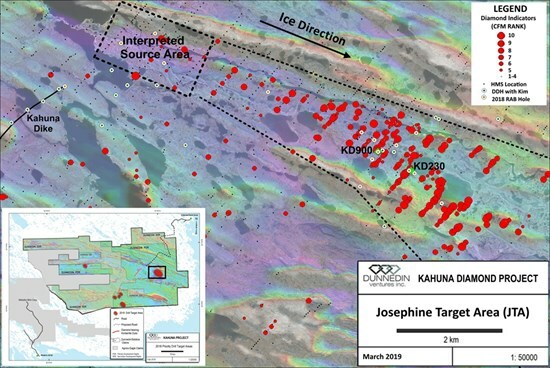 Dunnedin Ventures Inc. (TSXV:DVI) (the “Company” or “Dunnedin”) today announced results from 109 till samples collected in the Josephine Target Area (JTA) during the fall of 2018. Dunnedin Ventures Inc. (TSXV:DVI) (the “Company” or “Dunnedin”) today announced results from 109 till samples collected in the Josephine Target Area (JTA) during the fall of 2018. Results have defined a discrete target area for potential diamond sources of 3 km2 at the head of the JTA, a trend of abundant high-quality diamond indicator minerals (DIM) for which no source is known yet. Although the focus of Dunnedin’s near-term exploration plans will be on its recently expanded portfolio of large-scale copper porphyry projects in Canada and the USA (see news releases of November 29, 2018 and March 4, 2019), the Company’s next diamond-focused exploration campaign will be aimed at the discovery of kimberlite pipes within this newly defined area.